UPDATED: May 5, 12:33 a.m.
Of the students admitted to the College’s Class of 2020, 53.1 percent accepted offers of admission, yielding a class of 1,156 students from 2,176 accepted students, including 525 who were accepted early decision. The number is an increase from last year’s yield of 50.3 percent for the Class of 2019, and closer to the Class of 2018’s record yield of 54.5 percent. In years further back, the yield has hovered just below 50 percent — 47.8 for the Class of 2017, 48.5 for the Class of 2016 and 49 percent for the Class of 2015. Interim dean of admissions and financial aid Paul Sunde said that the College’s financial aid offerings were crucial in the higher yield figures, as financial aid was often the determining factor for any family concerned about the cost of college. Forty-four percent of the Class of 2020 will receive need-based scholarships, at an average of just over $46,000, down from last year’s 47 percent. Sunde noted that the financial aid offerings involved “a shift in socioeconomic mix in international students,” possibly due to the fact that the College ended need-blind financial aid for international students starting with the Class of 2020. While Sunde said the College has accepted the most geographically diverse group of international students in recent years, he also said that there are fewer international students receiving financial aid. The incoming class comprises the highest percentage of historically underrepresented students of color on record, including African American, Latino, Native American and multiracial students, at 23 percent. Sunde said that for this admissions cycle, the College particularly focused on diversity and accessibility. He said that the College had a more “energetic effort” to reach out to communities of color, aided by alumni volunteers who made phone calls to admitted students and their families. The percentage of public school students in the class is 57 percent, a seven-year high. Sunde said that this was a result of strong financial aid packages the College was able to offer, and that he saw this figure as a positive sign of accessibility. Fourteen percent of the Class of 2020 is made of up first-generation college students, while another 14 percent are children of College alumni. The Class of 2020 also includes a record number of students from the western United States at 25 percent, along with 24 percent from the Mid-Atlantic region, 18 percent from New England and 15 percent from the South. International students comprise 9 percent of the class. Sunde attributed the decline in the number of students from Mid-Atlantic region and rise of students from the West to national trends. He said that the College simply adapted to the trend by increasing recruitment efforts in the West. The College also enrolled a near-record number of women, at 51 percent. Sunde said he believes this is a result of students and families responding favorably to the College’s efforts to address prominent issues on campus. The average standardized test scores of the incoming class increased from last year, with a mean ACT score of 32.2 and average SAT scores of 719 in critical reading, 723 in writing and 724 in math. In addition, 92 percent of the Class of 2020 were in the top 10 percent of their high school class. Last year, 91 percent of the Class of 2019 ranked in the top 10 percent of their class. The mean SAT scores were 717 in critical reading, 722 in math and 722 in writing. Sunde noted the College’s different strategy for recruiting students this year. He cited the Dimensions of Dartmouth program as a significant factor that contributed to the high yield rate this year, adding that more students participated in Dimensions events compared to last year. About 1,300 students and their families attended this year. Sabyne Pierre ’20 said that she chose Dartmouth because of her experience during Dimensions, and she felt welcomed by everyone on campus. Jesus Franco ’20 said Dartmouth during Dimensions felt like home. “Everyone seemed to genuinely love the school and seemed happy to be there,” he said. Sunde said the new housing community system has also received positive responses from students and parents who visited Dimensions and that it may have influenced their decision to come to Dartmouth. He also cited large student and alumni involvement as a factor that helped students choose Dartmouth. He said that there was high attendance and enthusiasm at off-campus events hosted by admitted students. Students who were accepted early decision and who were accepted last year but chose to take a gap year were very engaged with regular admission students, he said. 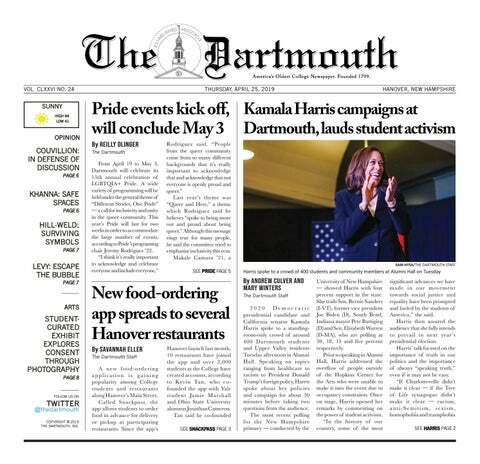 He noted current Dartmouth students were particularly involved in social media efforts this year and reached out to admitted students on social media platforms such as Twitter, Instagram and Facebook. Sunde said that more students accepted offers of admission than the expected number of 1,120, adding that the College is not planning to look at the waiting list for at least a few weeks. However, the College will be keeping a close eye on students who change their minds or decide to take a gap year, he said. Several members of the Class of 2020 cited different reasons for choosing Dartmouth over other institutions. Zachary Johnson ’20 said that he chose Dartmouth for its focus on undergraduate students. Itzel Paola Castaneda ’20 said she decided to come to Dartmouth for its community and inclusivity and also said she favored the College’s undergraduate focus, a point that Franco also noted. “The small class sizes, research opportunities, and alumni network were all amazing resources that I really wanted to take advantage of,” he said.